The most brilliant of all the planets, Venus, reaches its farthest point west of the sun in Earth’s sky on January 8, 2011. Astronomers call this a “greatest elongation” of Venus. At such times, Venus shines as the brilliant morning ’star’ in the east before sunrise. At its greatest morning elongation, Venus typically rises 3 hours or more before sunrise. Because the orbit of Venus lies inside of Earth’s orbit, Venus can never be opposite (180 degrees) from the sun in our sky. 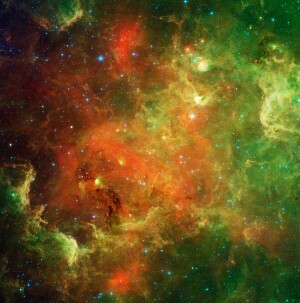 In fact, Venus can never get as far as 90 degrees from the sun, as the moon does at first quarter or last quarter moon. As seen on Earth’s sky dome, the maximum distance between Venus and the sun is about 47 degrees. 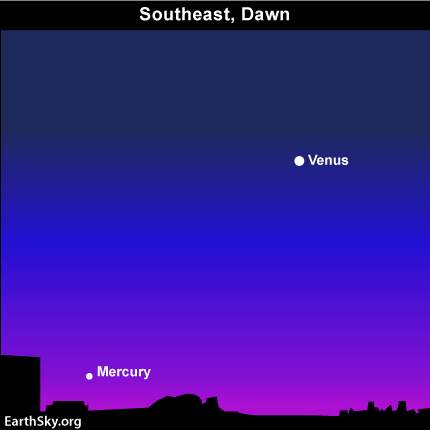 If Venus is west of the sun, as it is now, it is up in the eastern sky before dawn. If it is east of the sun, as it was for much of 2010, it is in the western sky after sunset. Look at Venus with a telescope tomorrow and you’ll see that Venus’ disk is half-illuminated in sunlight and half-immersed in its own shadow – just like the moon at first quarter phase. After tomorrow, Venus will slowly but surely wax toward full and will edge closer and closer toward the sun. Venus will pass behind the sun and into the evening sky by mid-August 2011. It is best to look at Venus through the telescope at twilight because Venus’ glare is overwhelming in a dark sky. After all, Venus ranks as the third-brightest celestial object, after the sun and moon. That will be obvious to you tomorrow, as you watch dazzling Venus at its greatest morning elongation during the dawn and predawn hours on Saturday, January 8, 2010. Site contents copyright © 2019 Recorder Online	except as noted. All rights reserved. | 88 queries in 2.352 seconds.